Results are in! The chart below shows how public support is growing for transportation options. See the Resources page for a printable version and for the full survey. Ever wonder how people get around in New Hampshire? Well, most people just drive, grateful to the state and municipal workers who keep the roads and bridges safe for travel. At least I hope they are grateful. I sure am. Your car is in the shop. You just got out of college and you can’t afford both a car loan and your student loans. You broke your leg playing sports and can’t drive. You never got your license. You have trouble seeing, maybe just because the doctor dilated your pupils at the eye exam. You have physical challenges that make it impossible to drive. You want to lower your carbon footprint. You don’t like losing two hours of productivity every day by driving to work. You are trying to get or stay fit, and want to walk or bike to as many places as you can. What are your options? Have a look below, and give some of them a try just for fun this summer. You never know when you might need to have another way to get around. If you want to walk or bike, have a look at the maps on this NH Department of Transportation web page to find out where the trails and other infrastructure are located. If you want to take the bus, NHDOT has a map that shows you all the intercity bus routes and the local transit providers. If you’re traveling beyond the NH border, MassDOT published the New England Regional Transportation Map in February of 2015. You can get a copy at tourist information centers throughout New England or by sending a request to publicinformation@bostonmpo.org or by emailing Fred Butler at NHDOT. An online version is promised by MassDOT at some point in the future. If you prefer to travel by rail, you can take the Downeaster to Boston or Portland from Dover, Durham or Exeter. On the other side of the state, you can take the Vermonter from Claremont north to Burlington or south to New York and DC. There’s also carpooling, for commuting and one-off trips, with online matching available here. If you need to get to the doctor or the grocery store, and you can’t drive, yet there is no pubic transit in your area, there are still options available. The nine Regional Coordinating Councils for Community Transportation (RCCs) have published transportation directories listing the options in each region. Some of the options are available to the general public, some are restricted to seniors and people with disabilities, some are restricted by trip purpose, and some are provided by human service agencies that only give rides to their clients. Have a look at this map of the regions to determine which region your town is in. Below are links to the RCCs and their directories. Be aware that some of these are very large pdf files. Also, I can’t seem to locate the Derry-Salem RCC directory. If anyone knows where I can find it, please let me know and I’ll update this blog post. The final report of the New Hampshire Capitol Corridor Rail & Transit Alternatives Analysis came out earlier this month. The alternatives can be compared in this matrix from the report. Governor Hassan spoke in favor of extending commuter rail from Boston into New Hampshire, both in her inaugural address and her 2015 budget address. You can also hear her strong support about 39 minutes into this recording of NHPR’s The Exchange on the topic of the state budget. Business leaders in Nashua and Manchester expressed their support for commuter rail in this article. Transport NH feels strongly that commuter rail will bring benefits to New Hampshire’s people and economy, and is a vital part of an integrated, modern transportation system. The report can be found in its entirety here. You can also download a short summary here. Whether you walk, ride a bike, take a bus or a train, or drive your car during this holiday season, we wish you safe travel and hope that you take time to enjoy all the little things that make this season special. 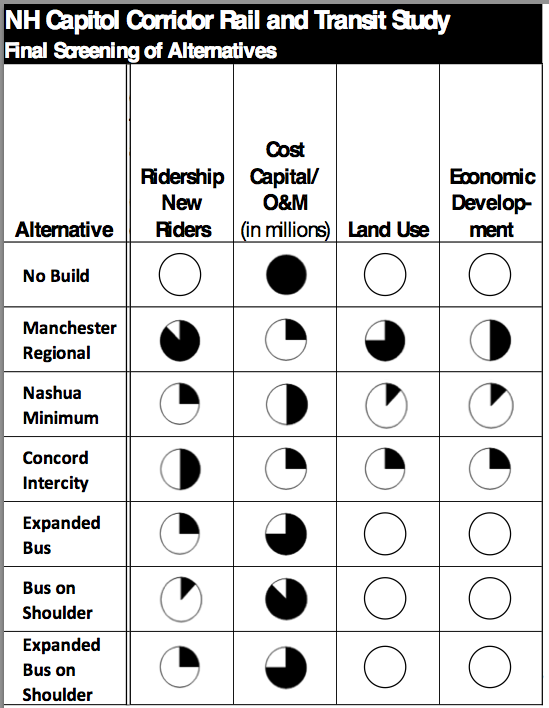 The New Hampshire Department of Transportation (NHDOT) will hold a public meeting on Thursday, November 20, 2014 in Nashua to seek input on the final set of transportation alternatives for solutions to transportation challenges that involve transit (bus and rail) and intercity rail options in the 73-mile corridor between Boston, MA and Concord, NH. The November 20 meeting will take place at the Nashua Public Library from 7:00 pm to 8:30 pm. This meeting will also provide the public with an opportunity to consider issues and concerns in the Environmental Assessment that is being prepared as part of the alternatives analysis. The NHDOT is evaluating opportunities to improve inter-city rail and transit service in the corridor through a study jointly funded by the Federal Transit Administration (FTA) and the Federal Railroad Administration (FRA) that was approved by New Hampshire’s Executive Council in February 2013. The study is an alternatives analysis with an Environmental Assessment that will examine rail and bus transit options, as well as intercity rail alternatives, to address transportation, economic development, sustainability, quality of life. and environmental issues along the I-93 and Everett Turnpike corridors from Concord to Nashua with connections to Boston. 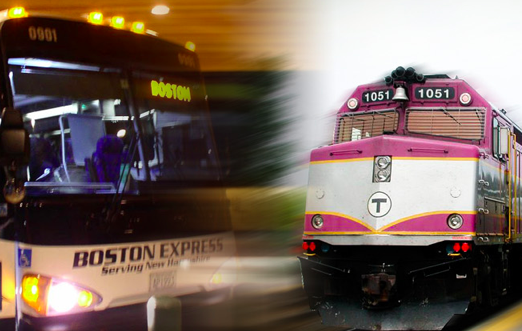 Increasing transportation demand and growing concerns about mobility, economic development, and quality of life have led citizens and officials in New Hampshire and Massachusetts to explore options to improve transit service between southern New Hampshire and Boston. This study is evaluating a diverse set of rail and bus options for improving transportation using the existing rail line, US Route 3 and Interstate 93. Want options? Now’s the time to ask. In New Hampshire, we prioritize transportation spending through the Ten Year Transportation Improvement Plan. Our Department of Transportation (NHDOT) helpfully provides a brochure to explain this two year process. 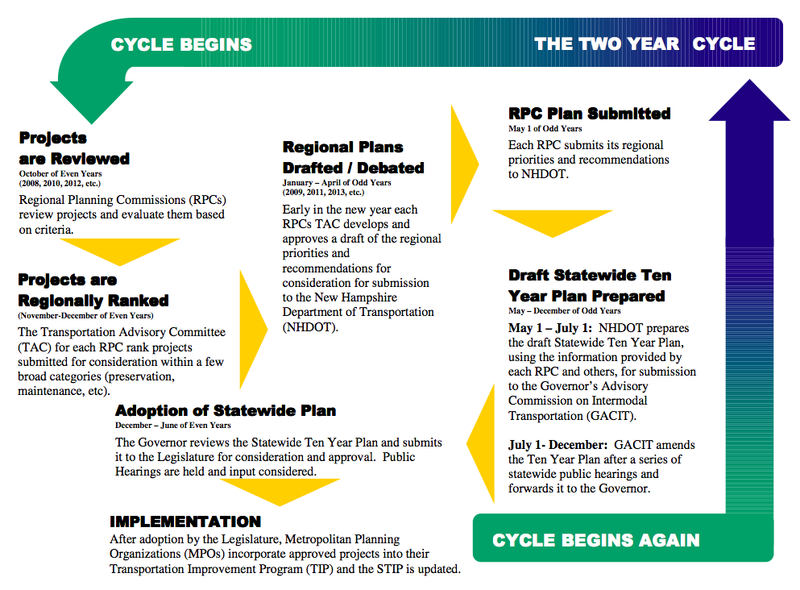 You will see that the first step on this flow chart is for the regional planning commissions (RPCs) to assess local and regional transportation needs in the fall of even years (such as 2014), solicit new projects from communities, then evaluate them, rank them, and pass on their recommendations to NHDOT by May 1st the following spring. NHDOT then prepares a draft Ten Year Plan based on these recommendations and submits it to the Governor’s Advisory Commission on Intermodal Transportation (GACIT). GACIT sends it to the Governor, who then sends it to the Legislature. The 2015-2024 plan was signed into Law by Governor Hassan August 1, 2014. The process then starts all over again. The GACIT is comprised of the five Executive Councilors, plus the Commissioner of NHDOT in a non-voting role, as defined by RSA 228:100. They hold public meetings around the state on the Ten Year Plan in the fall of the odd years (such as 2015). You can find a summary of the 2013 hearings, plus a copy of the transmittal letter from GACIT to the Governor, on this webpage. The question is, how do projects get into this process in the first place? The answer is that the RPCs solicit projects from the municipalities and other institutions (universities, transit agencies) in their regions, usually through the local planning boards. 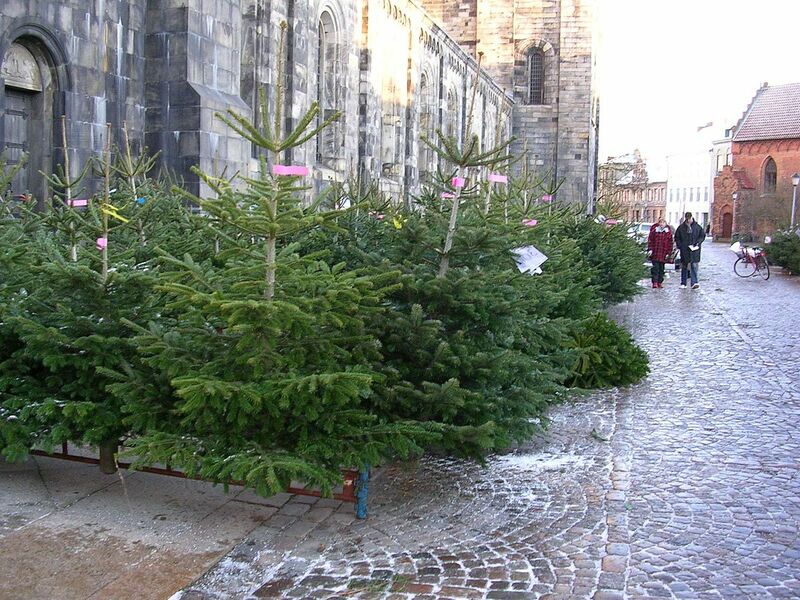 The RPCs start this as early as October. Projects originate here as well as through regional corridor studies guided by steering committees of local representatives, or statewide needs identified by NHDOT. Some specific federal funding programs targeting bicycle and pedestrian projects, such as Transportation Alternatives or Recreational Trails, have separate application windows that run on different cycles, but bicycle and pedestrian projects are also eligible for the general Ten Year Plan solicitation process. If your community would benefit from having a project included in the Ten Year Transportation Improvement Plan, start now by talking to your planning board and reaching out to your regional planning commission. Ask your planning board how they decide which projects to submit to the RPC. It all starts locally. A new report from the U.S. Public Interest Research Group (U.S. PIRG) Education Fund and the Frontier Group shows mounting evidence that the Millennial generation’s dramatic shift away from driving is more than temporary. While the 2000s saw a marked decrease in the average number of miles traveled by young Americans, the study explains that those trends appear likely to continue even as the economy improves – in light of the consistency of Millennials’ surveyed preferences, a continued reduction of Millennials driving to work, and the continued decreases in per-capita driving among all Americans. Census data shows that the share of 16 to 24 year-olds traveling to work by car declined by 1.5 percentage points between 2006 and 2013, while the share of young people getting to work by public transportation, on foot or by bicycle, or else working from home, had increased. Young people aged 20 to 30 are less likely to move from central cities to suburbs than at any time since at least the late 1990s. Millennials consistently report greater attraction to less driving-intensive lifestyles — urban living, residence in “walkable” communities, and openness to the use of non-driving modes of transport — than older generations. Fewer young people are getting their driver’s licenses than even a few years ago. The percentage of high school seniors with driver’s licenses declined from 85 percent to 73 percent between 1996 and 2010, according to the AAA Foundation for Highway Safety, with federal data suggesting that the decline has continued since then. Millennials are the largest generation in number and they will be the chief users of the transportation investments that get made over the coming decade. Millennials are expected to drive more as they reach the peak-driving years of middle age, but if they drive less (or even no more) than their parents did in middle age, it will be a monumental shift in travel trends since the 1950s and the assumptions underpinning current transportation policy. In reviewing a wide range of data from the last few years, the report finds that many of the reasons why Millennials are driving less are long-term trends that are likely to last. While young adults “living on their parents’ sofa” increased during the recession, the share living in their parents’ homes had also been increasing even prior to the recession. The recession may have caused some Millennials to delay forming separate families that would likely drive more, but Americans have been getting married and having children at a later age nearly continuously since the 1960s. These trends have continued during the recovery. Graduated driver licensing requirements adopted in recent years by state governments have likely played a small but important role in causing young people to delay or forgo getting a driver’s license, potentially encouraging Millennials to develop less car-dependent transportation habits that they may carry with them as they age. Americans drive fewer total miles than we did in 2005, and fewer miles per capita than we did in the mid-1990s. People are riding public transportation more than at any time since the mid-1950s, the number of people working at home continues to surge, and bicycling has become the fastest-growing mode of commuting. Demand for housing and office space in walkable neighborhoods of many cities is outpacing the supply of new construction. The report calls on public leaders to rethink their transportation investments to accommodate and encourage the Millennial generation in its desire for less car-intensive lifestyles. This includes greater investment in public transit and biking infrastructure, and using highway funds to repair of existing roads rather than building new are wider highways. State and federal governments should also assist efforts currently being led by cities to encourage walkable communities and innovative uses of technology that connect travelers to more travel options and shared vehicles. The new report can be found here. Venues & Voices is HERE! Wish you could have a say in transportation policy? 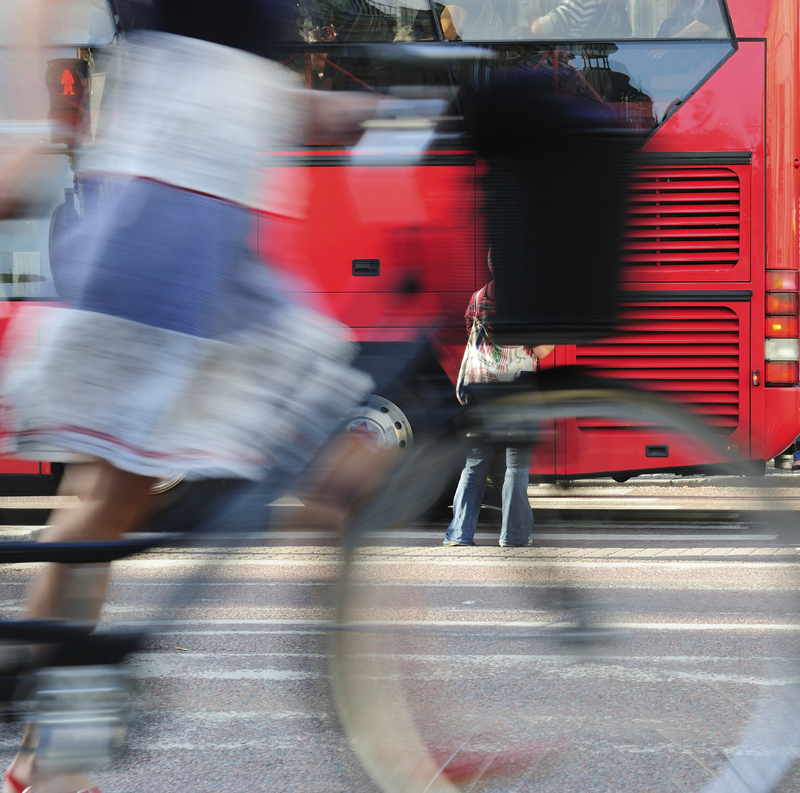 Do you want more transportation options in your community? What does Abundant Access mean?